The Irishman Cask Strength – The Irishman are delighted to announce the first vintage release since their official Distillery Expansion Partnership with Illva. This is their exclusive 2013 Cask Strength expression. Following from the success of a major re-design of packaging to give an ultra-premium look and feel to the bottle; we can safely say you can judge the book by its cover. Put plainly, ‘Cask Strength’ means that the whiskey is bottled at the natural strength, non-chill filtered and non coloured, straight out of the barrel and The Irishman choose only the finest American Oak Bourbon Casks to put its much loved triple distilled whiskey into. This years Cask Strength has come in at 54%, and delivering a wonderful combination of soft bourbon notes with a light malty subplot. Following through with a creamy oak and spice that gives it magnificent superb complexity which balances its expressive strength. There are only 2160 bottles are available worldwide in this limited edition and each bottle comes individually numbered as a mark of high quality and is non-chill filtered. The Irishman Brands was founded in 1999 by Bernard and Rosemary Walsh in Co Carlow in the heart of Ireland. The company specialises in producing and building innovative, authentic Irish spirit brands including the Irishman Whiskey Range. 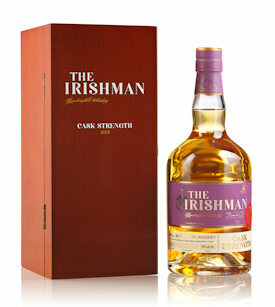 In 2006 the Walsh’s launched the Irishman Irish whiskey range with 2 expressions; an Irish malt and a premium blend. The Irishman whiskey has claimed many accolades since then including one of the highest ratings for any Irish whiskies in Jim Murrays Whisky Bible with 94.5 points. Each year the Walsh’s endeavour to add at least one new expression typically a select Cask Strength bottling. In 2013 the company released its first 12 year old single malt. The Irishman brands have gained ready acceptance in over 36 countries spanning 4 continents. In line with this update, The Irishman Whiskey is also launching a new website that includes, amongst other features, a news-driven blog for friends of The Irishman to stay connected with their favourite tipple and location for consumption across the globe.